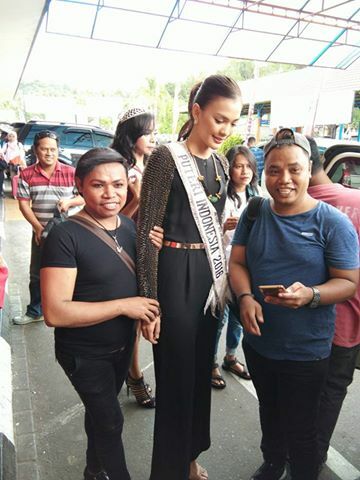 Miss Universe Indonesia 2016 Kezia Warouw cried harassment after being touched from behind by someone during her visit at the 72 Hari Pers Nasional di Kota Ambon (72nd National Press Day in Ambon) last February 9th 2017. Miss Universe 2016 Top 13 semi-finalist told that while she was sitting at the front of the stage, she felt that someone was touching and holding her back. She couldn't turn at her back during that incident 'coz it was difficult for her to turn with her tight gown and huge crown. Kezia also shared that she was not attended properly by the event organizers. She was not picked up by the committee at the Ambon Pattimura International Airport , abandoned her after reaching Ambon with no coordination from the organizers. She was not even provided any accommodation. Meanwhile, the Head of Information of the Pattimura Military Command, Colonel Muhamad Hasyim Lalhakim was deeply sorry about what Kezia had experienced.